Michael Leake had the most liked content! eBay is really a roll of the dice, I have purchased good quality working items and items that did not work at all and required quite a bit of repair. Test each motor first, they could both be bad, but I think that may be a low probability. See if you can move any of the moving parts of the motor by hand, they could be rusted or corroded in place. TO: anyone I purchased what I think is called a periscope attachment for my arri 16st. It seems to work just fine and I think I attached it correctly. If anyone has more knowledge about this item or an owners manual, I would appreciate the information. 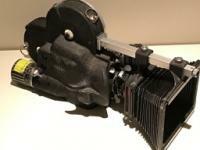 I also recently purchased two arri 200' magazines and one motor to fit. I am servicing them so they will work. Thanks Michael Leake TO; Mark Day, yes post pictures, always interested. Mark Dunn: It can be done, but even the Mamiya 50mm lens gives a really wide angle for the RB67 medium format camera, I just finished a test with the mamiya 50mm on a makeshift mount. It works, however, it does not give you wide angle at all, infact it looks like a 75mm standard lens in the arri viewfinder, adapter project is over. Lenses: has anyone adapted a Mamiya RB67 lens to an Arriflex standard mount??? I have several RB67 lenses. I know the focal lengths are different, but is it possible? I think I must have an arri 16SB, one of the ports has a stainless steel liner and the lenses I have seem to mount into this port with a little more security. More information, I have seen on eBay, some arri lenses which were inexpensive. they were advertised as being 35mm lenses. I take that to mean that they would fit a 35mm camera and would not be compatible with an arri 16 SB. they were PL mount and looked like the PL mount could be removed. I have seen some some lenses for an arri 16 which had PL mounts. They also looked like the PL mount could be removed to reveal an arri standard mount lens. Also, I probably would be better off if I saved for an arri standard mount lens. They seem expensive, however. I may have found some arri 16 S magazine in 200' capacity. I do not know if they come with torque motors.